The first day of Chinese New Year began on 5th February. Fun fact: usually it is held on the new moon that appears between 21 January and 20 February. Each year it is symbolised by an animal; this year 2019 is the year of the pig. I think the Chinese pig is supposed to be a boar but I decided to draw pink farm pigs.. 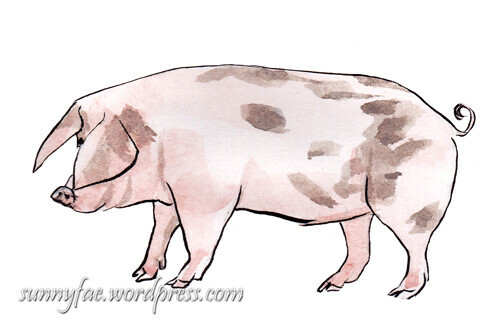 These two little piggy’s were drawn separately on a page. 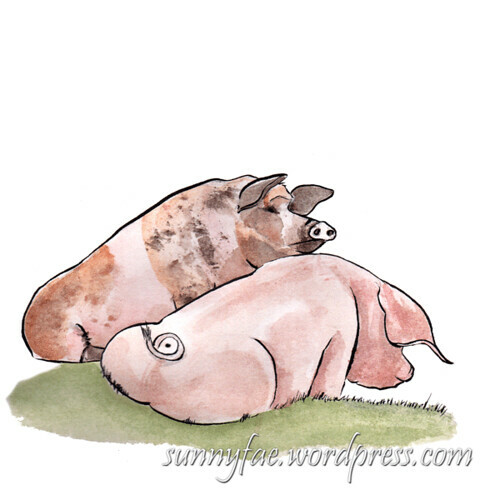 For some reason I had drawn both pigs sitting down and as I looked at the images in the computer I thought they looked like they belonged together on the bank so I took the white background off and sat one pig behind the other, like two friends sitting on the grass. 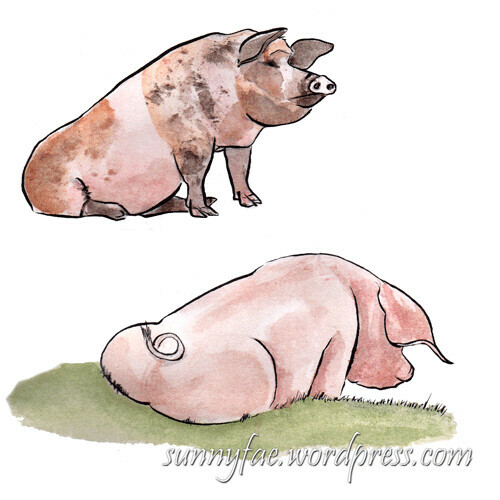 Two pigs sitting separately on a page. this is how they originally appeared in my sketchbook. Here’s another little pink piggy out for a walk. My favourite of all the pigs is the one at the top of the post. She’s a red river hog (the male hogs have small tusks) and we regularly see them at the zoo. A few years they were a couple of happy hogs enjoying the quiet life, now they have developed into quite the family with two piglets in 2017 and three last year. They’re obviously very happy river hogs. 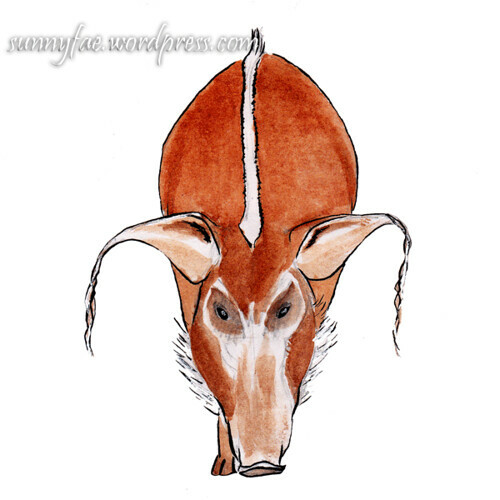 I love red river hogs ears so much; they start out as pointed elf like ears and the older they get the longer the hairs on the ears grow, amazing! 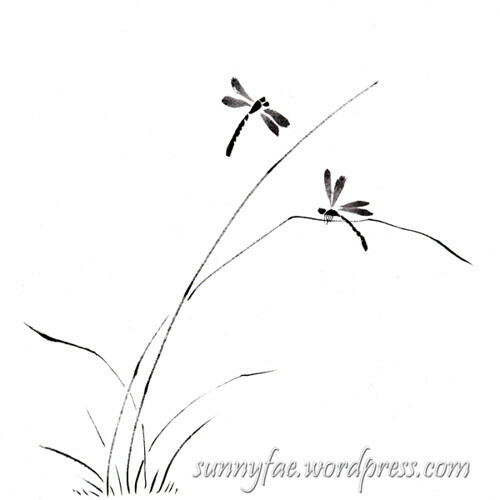 Chinese brush painting bulrushes & dragonflies. 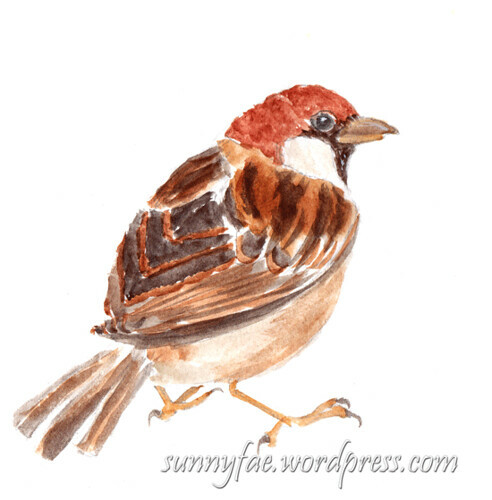 Brown ink & gouache. On the first day of every month there is a twitter challenge called pinch punch post. I haven’t participated for a few months, Christmas was too hectic and last month I forgot (no excuse really!) This month I remembered, whoot! The theme was dragonfly. 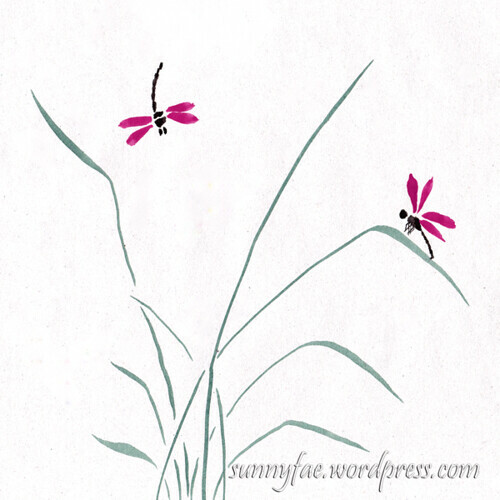 I had thought of painting a dragonfly with lovely colourful wings and was searching the interwebs for inspiration when I stumbled across some Chinese brush painted dragonflies dancing around some bulrushes. 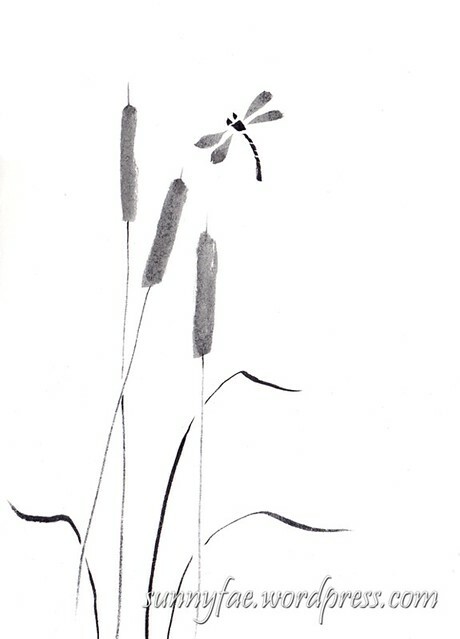 Since I haven’t painted bulrushes with Chinese brush painting and didn’t have any instructions I wondered If some of the brush strokes and exercises I’d already learned would transfer to these, then I could paint little dragonflies fluttering around them, it also gives me a chance to practice my Chinese brush painting. I’ve taken a few photos of bulrushes in the past so I shuffled through them to find something useful. 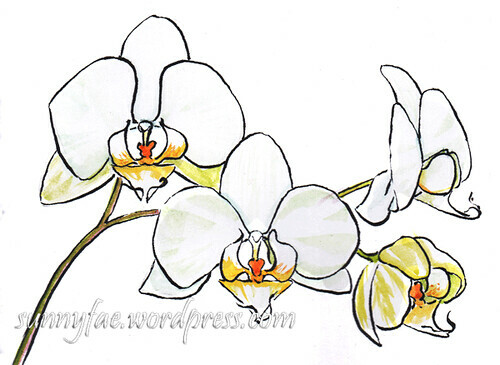 These were the first little tries, painted with a brush pen to get an idea of the shapes. 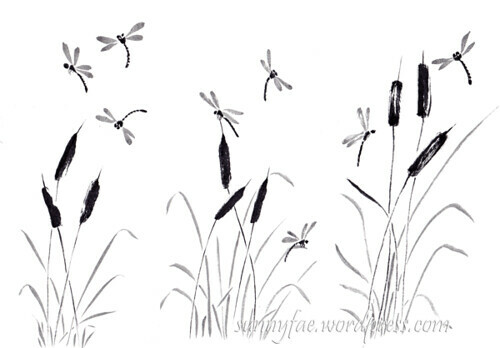 Chinese brush painting bulrushes & dragonflies. Painted in black (watered down to grey) ink, working how to make the shapes as I go. Another practice this time using grass for the dragonflies to land on, I really liked the shape of this one. Next I moved onto coloured ink and gouache. 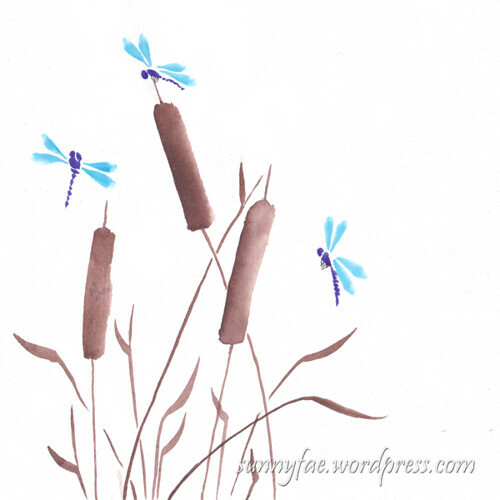 I’ve used brown ink for the bulrushes and gouache for the dragonflies. 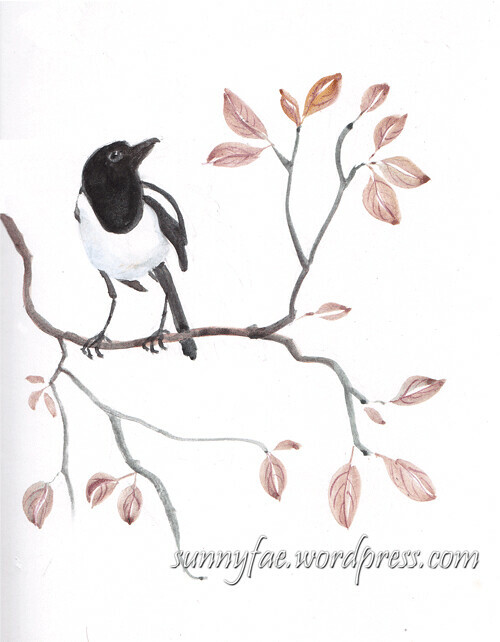 Chinese watercolours are quite opaque and nearer to what we would call gouache than traditional western watercolours, I used what I had, they came out OK but I think I prefer the inky ones more. 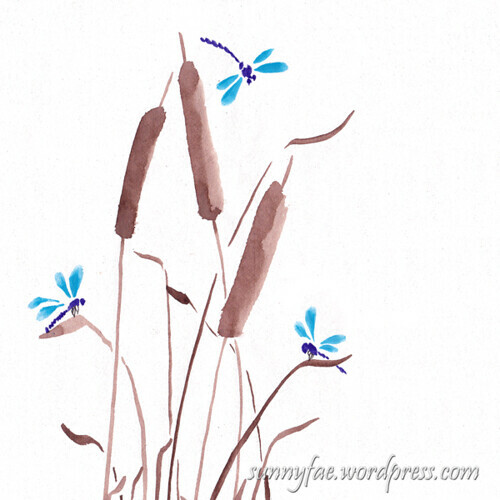 bulrushes & dragonflies, painted with brown water-soluble ink and gouache. Chinese brush painting green grass & dragonflies. I used my new green ink for the grasses. They were all fun to paint and it’s good to practice my Chinese painting skills, I haven’t really used them much since inktober. 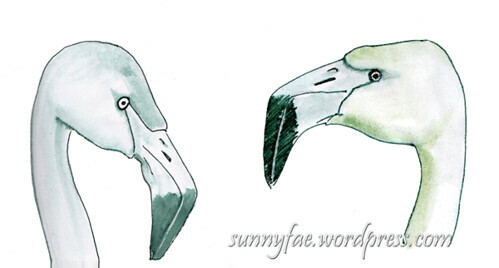 Two flamingo heads drawn with green ink. We wanted to draw flamingos, the weather was OK as we arrived at the zoo then suddenly the heavens opened and it rained and rained and rained! It was too wet for sketchbooks so we did what everyone else did and hid from the rain in one of the animal houses. Normally we would sketch in the houses but there were so many people and not too much room so we just spent the day enjoying the animals. I received some new fountain pen inks this Christmas, they are all small sample bottles, if I like the ink enough and use it I will maybe buy the full-sized bottles in the future. Flamingos drawn in red ink , I drew over some of the lines with a pentel brush pen and the feathers are a mixture of gouache and watercolour. 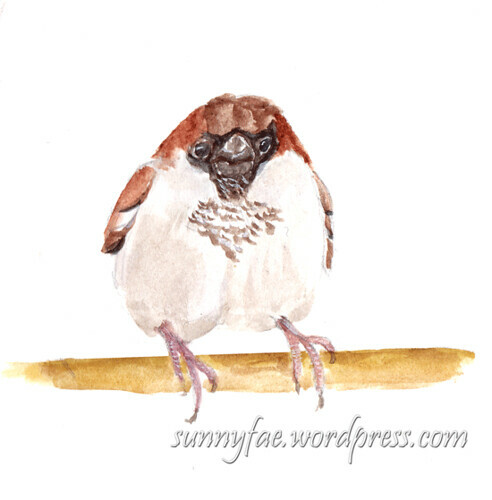 I drew a few close-ups of their heads to try to work out where the eyes and beaks are positioned, this is usually difficult when we see them at the zoo because they’re quite far away. I drew this one too close to the gutter of the page so it didn’t scan too well. 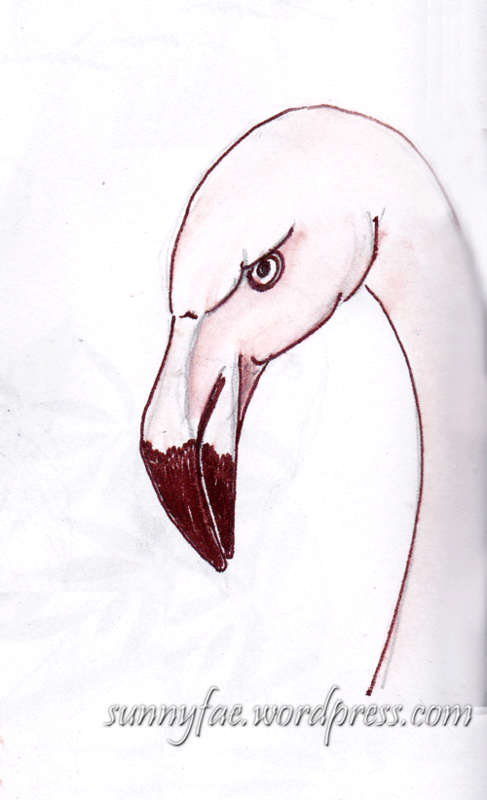 I do like the look on her face though, a slightly peeved pink flamingo. These were little gesture studies, there are others but I had painted them with watercolour and the scanner didn’t like to colour so these were the only ones I can show. 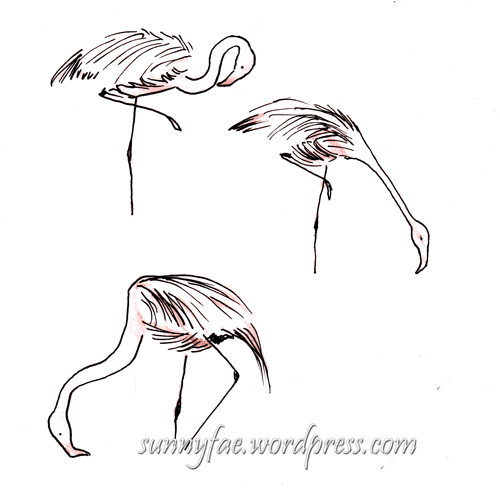 A few flamingo gesture sketches drawn with a fountain pen and brown ink. Trying to work out the direction the feathers lie. 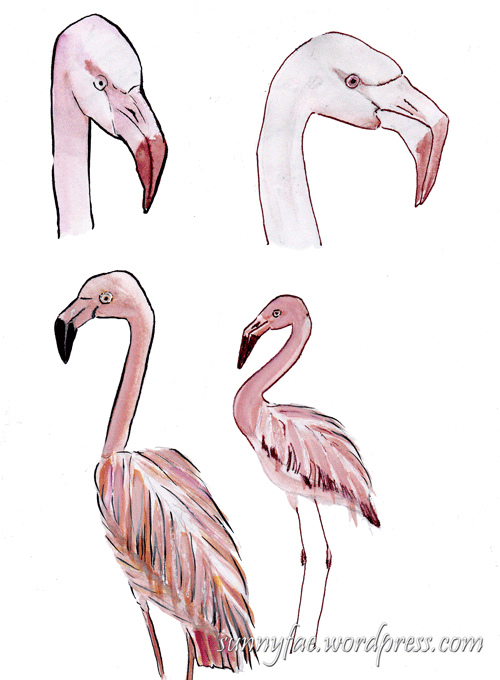 Maybe next week we’ll have better weather then we can spend a little time drawing real flamingos. 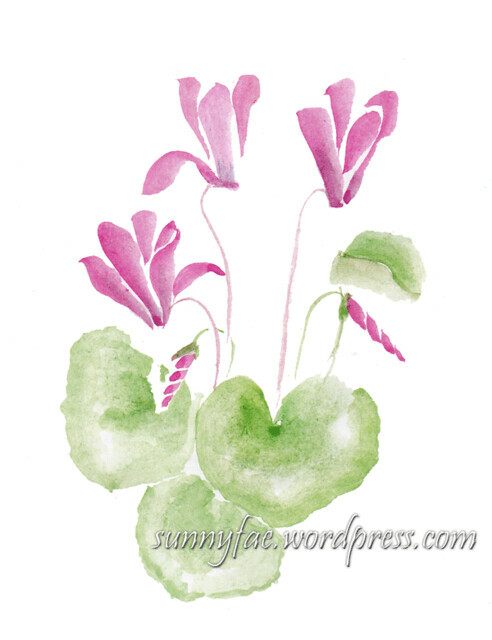 Over Christmas my trusty cyclamen flowered. This plant never fails to amaze me; no matter how many times I try to kill it (not on purpose obviously) it fights back, and rewards my ineptitude with loads of pretty pink flowers. This plant is a fighter and its determination is unrivalled. 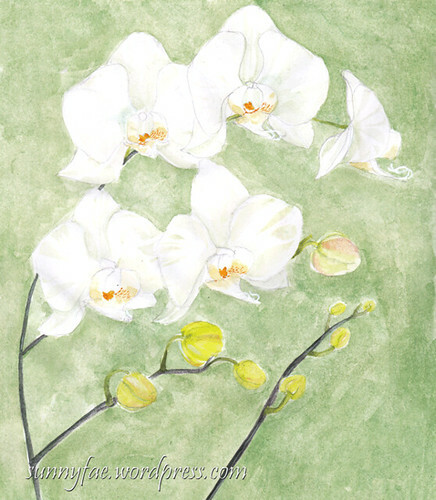 I had intended to draw the flowers sooner but it was Christmas and other things took priority. Still it flowered. 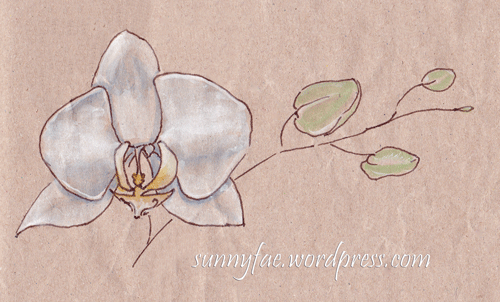 The flowers are coming to an end now so I need to draw it quickly before it’s too late. 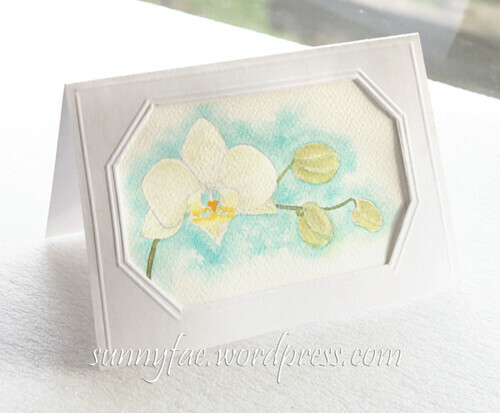 They are painted with a water brush and I tried to paint each petal in a single stroke, I think it sort of worked. 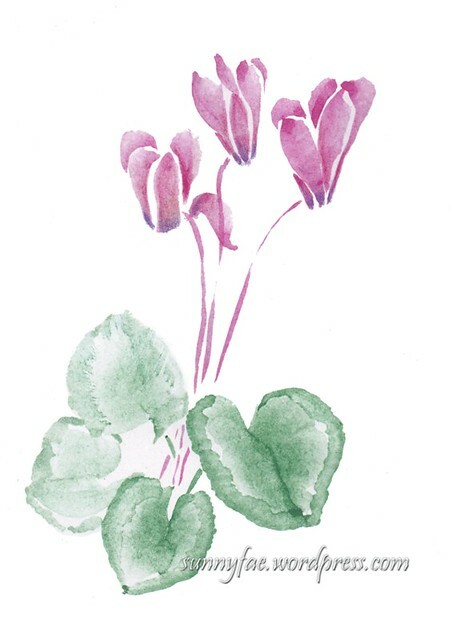 The leaves were a little more difficult; they are almost heart-shaped and have a pattern. I’ve just tried to imply where the pattern would be, maybe I’ll do something more detailed later. I’m using a water brush on sketchbook paper so there’s no washy watercolour-y loveliness, the paint goes where it hits the paper and it pretty much stays there. The fun is trying to find ways to work around or even with the papers properties. 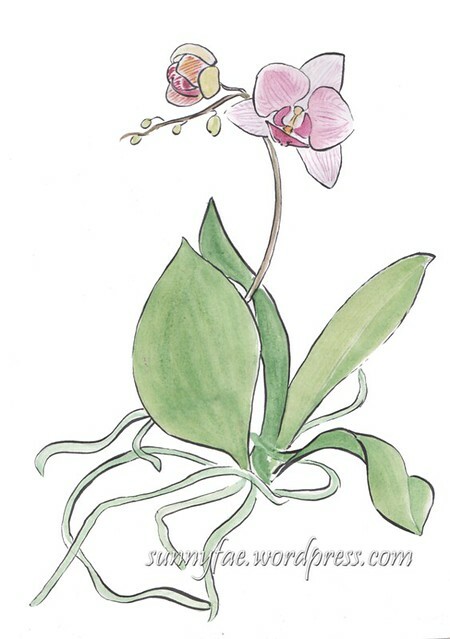 Another plant doing well on the window-sill at the moment is my orchid. It was given to me as a gift a couple of mother’s days ago and am pleased to report it’s doing extremely well! I’ve tried a few times this week to draw and paint it with limited success; these were the only ones I liked. I’m well on my way to 10,000 rubbish drawings. 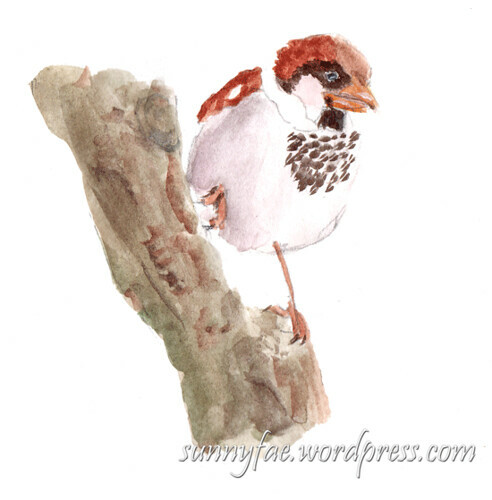 This first one is painted with gouache, meh I’m not that fussed about it. Gouache is not my favourite art medium; it’s a bit like painting with coloured mud. Obviously I need more practice. 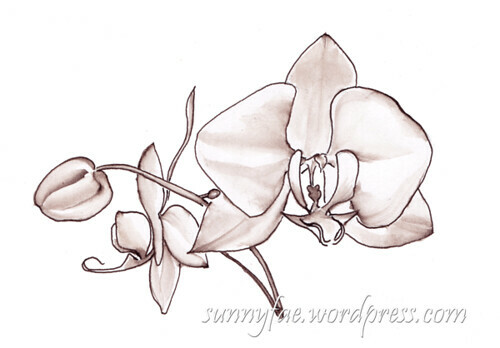 Then I drew the whole plant. Some but not all of the roots are drawn here, they poke out all over the pot and into the dishes of other plants, it needs re-potting really. When the flowers die back I will do a search to find out what I need to do and hopefully this won’t kill it off completely! 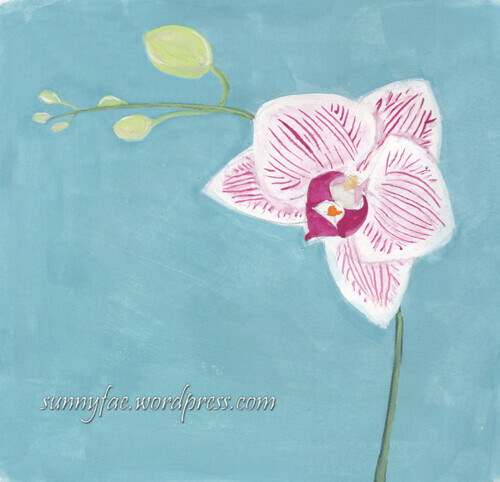 As you can see there are still a few more flower buds left to bloom so I’ll just keep trying. Hello there, welcome to 2019, how are you? Well, new year, new sketch book. It doesn’t really bother me if a sketch book carries on into another year or not, they’re all dated when they’re finished and each book is a continuation of the last, but this year I finished it at the end of December whoot! Normally I use an A5 sized book but this time I am using a 7 ½ x 9 ½ inch note book I found in the back of a cupboard (still using stuff up). It’s an odd size, bigger than A5 and smaller than A4, filled with a coated cartridge paper. I’m sure ill get used to the bigger pages as I use it. Last week we had a visit from the friendly neighbour hood magpies. 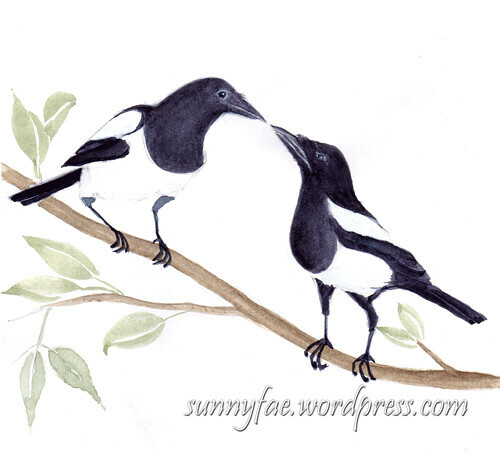 I’m sot sure they are the same magpies that nested in the tree behind our garden (it’s very hard to tell). 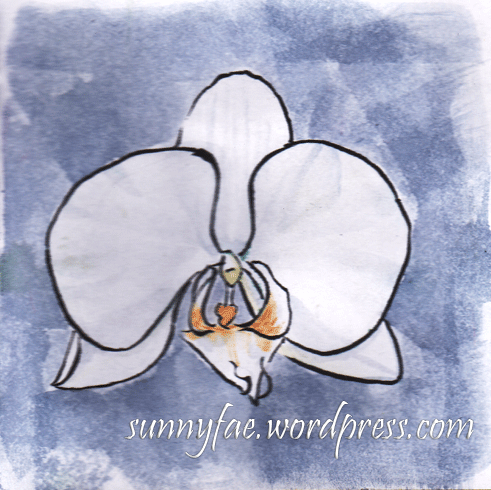 I’ve used dark blue and dark paint colours, including indigo, payne’s gray and neutral tint rather than black. They all seem to work to some degree. 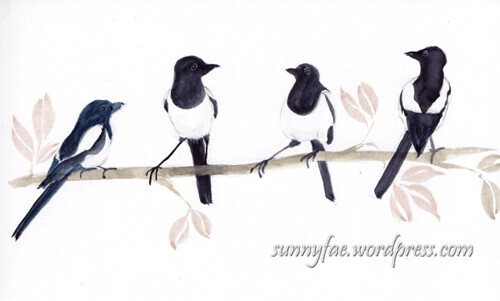 There’s quite a population boom of magpies around here this year, I wonder why that is? 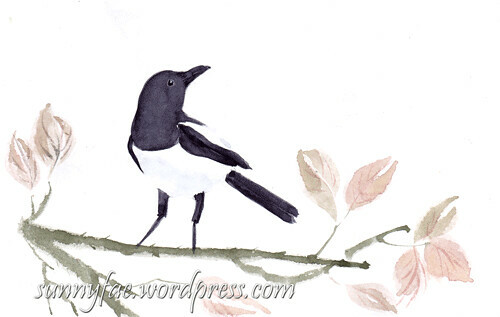 Any how thinking about magpies made me want to draw some. The paper in my new sketch book seems to take light washes of watercolour quite well; So far so good. 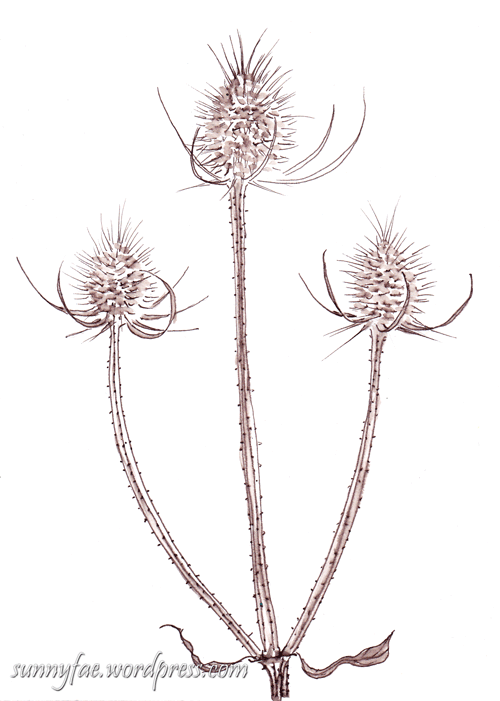 A teasel drawn from the front and back. It’s the end of the year already! A time that makes most people think about the past and present simultaneously. 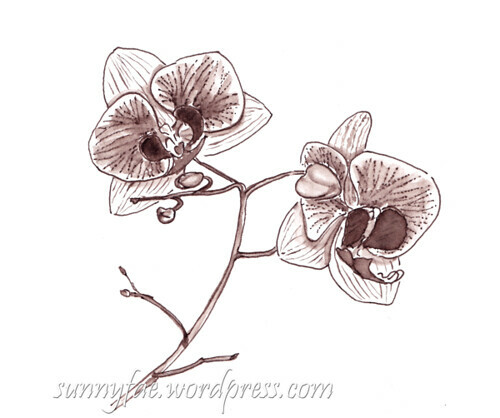 These drawings, a few hawthorn berries and teasels found on a winter walk were drawn with a fountain pen in brown ink brushed out with a water brush. 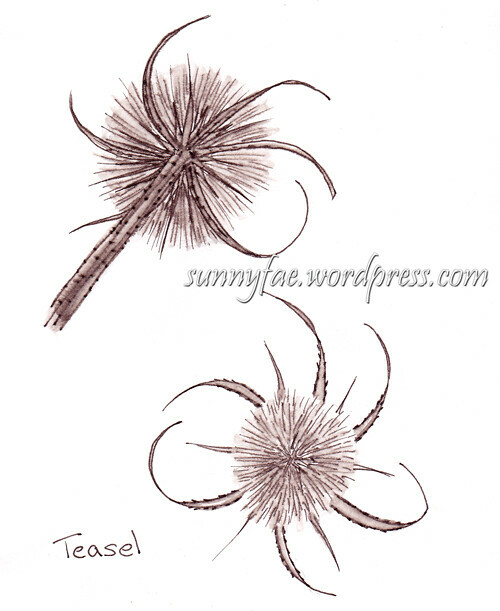 A teasel sprig drawn in brown ink. 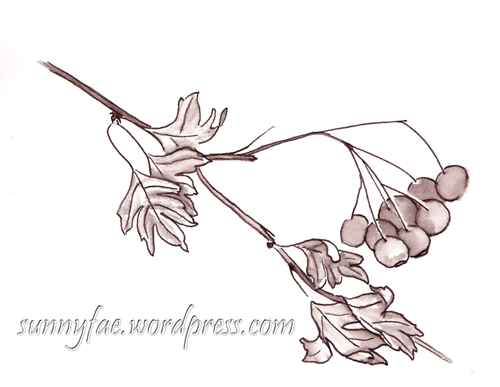 A few hawthorn berries drawn in brown ink. 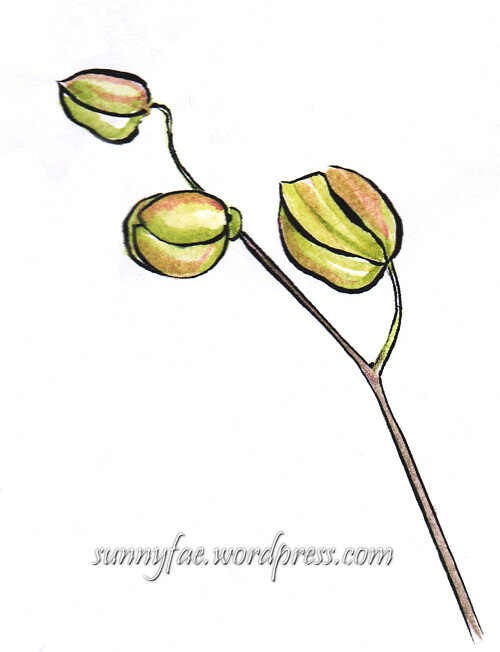 All carry their seeds into the new year filled with hope, ready to grow into future plants. As we move forward Lets all take the seeds of hope into 2019. I would like to thank each and every one of the people who have stopped by, liked or sent uplifting and encouraging comments. You make the whole experience such a pleasure. 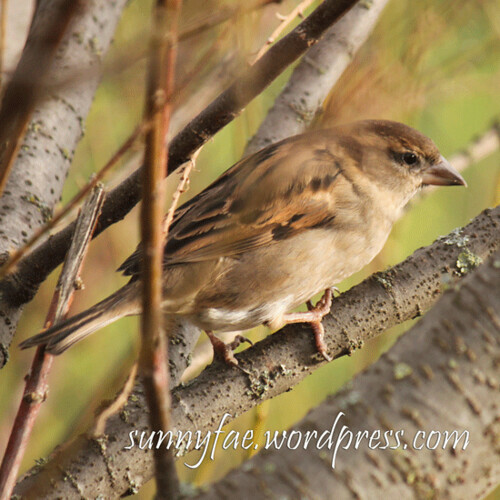 Have a very happy and healthy New Year everyone.